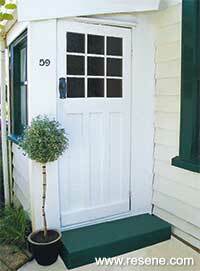 A new step and a lick of paint transform a drab entranceway into a shining star. You will need: Some wood scraps to make a frame for step, readymade concrete, waterblaster, sandpaper or sander, level, saw, nails, trowel, grinder with diamond bit or hydrochloric acid, see above, paint brushes, new door handle and a potted plant. Resene Non-Skid Deck & Path Paint in Resene Petanque, Resene Lumbersider in Resene Alabaster. Note: When fully cured, the concrete step must be diamond ground or acid etched to remove the top surface that could be powdery or loose and friable. For acid etching, dampen the surface with water then treat with a dilute solution of hydrochloric acid. Alternatively, use a grinding machine. The idea is to finish up with a surface profile of about the same roughness as 180 grit sandpaper. Before creating the new step, remove leaves and debris and clean the surface of the house and door with a waterblaster or soapy water. 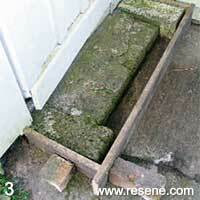 Instead of removing the old step, we’ve concreted over the top. Build a frame out of the wood scraps around the old step. 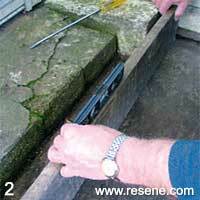 Nail the frame together and brace firmly with concrete blocks or wooden braces. Use a level to ensure the frame is straight. Mix the concrete. Continue adding more levels to the box. If the boards do not fit quite right, cut them slightly so that they do. Screw them in place using the 65mm screws. 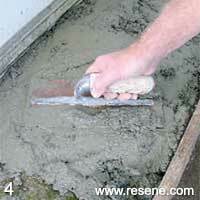 Once the mix has been poured and compacted, screed the surface. 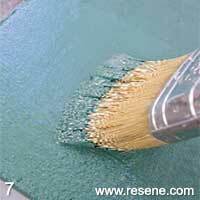 Allow to dry for an hour, then remove any air bubbles or irregularities. Allow the concrete to fully cure for at least a month. 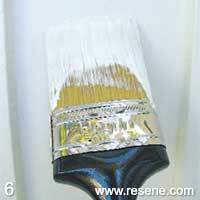 Meanwhile, sand the door and paint with Resene Lumbersider. 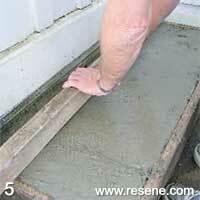 Once cured, the concrete step should be diamond ground or acid etched (see note above). 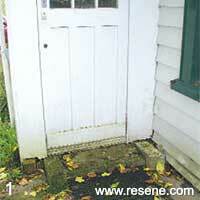 Paint with Resene Non-Skid Deck & Path. 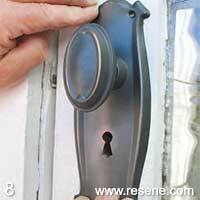 Apply finishing touches – a new handle, house numbers and plants.